This evening is Fusion Beads' annual silent charity auction, Sparkle for a Cause benefiting the Treehouse Little Wishes program. 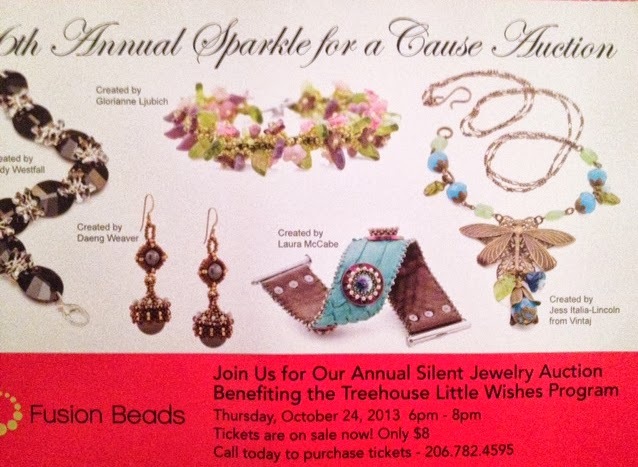 It's a fantastic auction of jewelry pieces by the the instructors and employees at Fusion Beads and I've heard there are still tickets available. 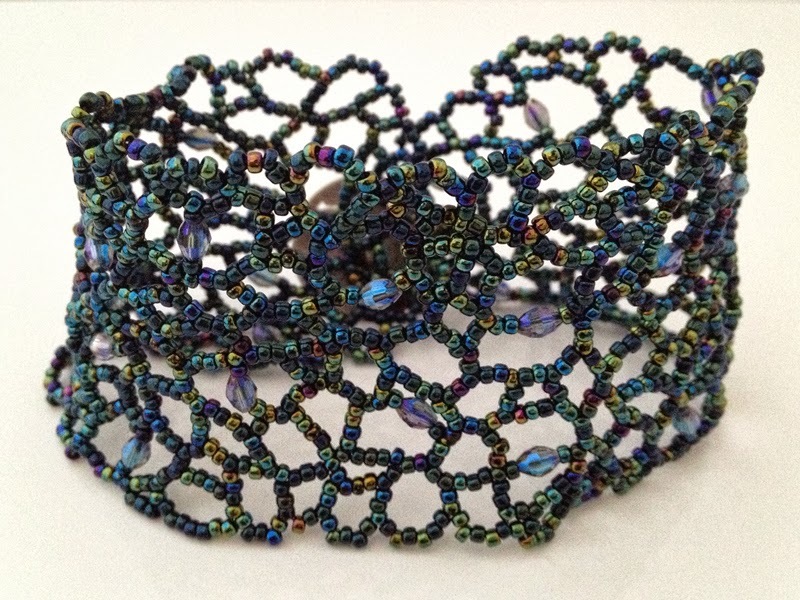 Yep, it's one of my Lacework Bracelets. this one's in my Midnight Lace color way, though it has a different vintage-style button than in my kits. 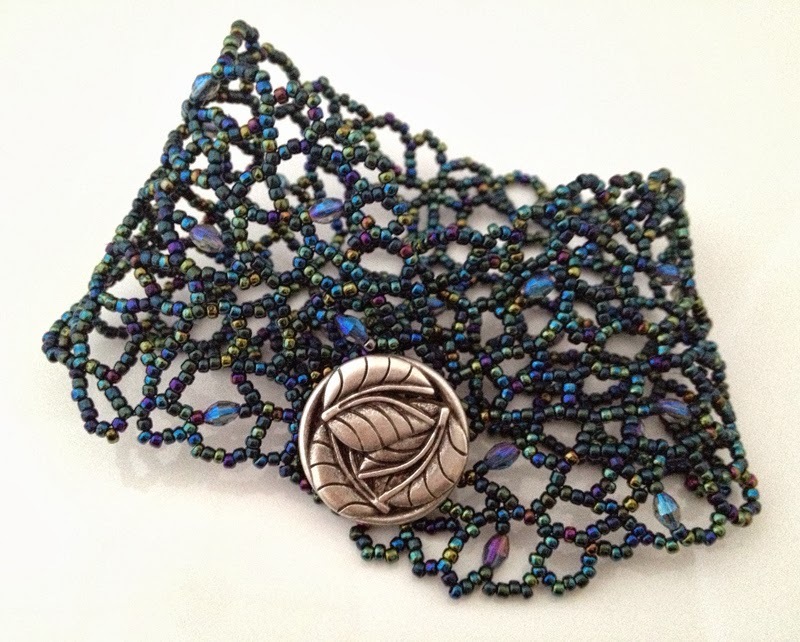 The cuff has such sparkle when it's worn, it seemed like a perfect fit for this auction. So, if you happen to be in town - doors open at 6:00pm. I can say from past experience that it's a thoroughly enjoyable evening. Since I'm totally drawn to the ocean in my design themes, I've decided to play with the idea of the Message in a Bottle for next month's freeform peyote Found Objects Challenge. First I had to find a bottle. I scrounged up three. The dark brown one came from Joe's grandmother's house and almost won the coin toss until he pointed out that you wouldn't be able to easily see that there were messages inside. On to the next: the Pyrat is a great shape, and it's RUM, but the bottle is ungodly heavy (heavy means more likely to damage any beads underneath). And it's big! While I'm not expecting to completely finish the piece before the reveal, I'd like to get somewhere close. I want my bottle to be crammed full of messages. Message on top of message on top of message. Since I like making up stories, I'm sure I can come up with quite a few. But wouldn't it be more fun if I weren't the only one? Say there was a whole community of castaways and lost souls, with only one bottle between the lot of them - would they fight over the bottle, or decide it was community property and use it as the local post office before throwing it into the sea? I'm inviting you to send me messages for my bottle. You can comment to this blog post below, or you can email (skunkhillstudio at yahoo dot com) me directly. Funny, sad, witty, a wish, thought-provoking rambles, a story message from your imagination or from real life - anything but crudities will go in. Send me Messages for my Bottle - Please! I love the little reverse on the theme, too. Thank you for becoming a part of my latest project! Oh, and for those of you who follow my Facebook page, the round, beaded disc I posted there yesterday is the base for my beaded bottle. It comes from a suggestion by David Chatt. From what I remember, he noted that a single layer of seed beads underneath a fully beaded bottle is very fragile - just the weight of the glass and the beads above can be enough to damage them. As an alternative, he suggested using cubic right angle weave to provide a sturdier base, since it's three sandwiched layers of beadweaving. So that's what it is: cubic right angle weave in the round. Now it's time to start working with freeform peyote. I'm writing to tell you I need you. That's right, I've been swirling around in the breathtaking labyrinths of your unconscious mind for a while now, and I'm itching to leap into the world. The only way I can come out, though, is if you commit to writing me in November. So, if you haven't already, please sign in for 2013 NaNoWriMo and create me. For inspiration, just read Abby's story in our 2012 Annual Report. Abby's novel was such a powerful force that she faced down naysayers, found a way to write while juggling a busy life, and then crossed the finish line on the shoulders of NaNo's amazing community. I know we'll write a gobsmacking, mind-bending story as well, so please commit to writing me in the following ways. Start prepping with a NaNo notebook—just released! We have so much to decide. Who is our protagonist? What sorts of wicked plans are our tales' rapscallions hatching? Sure, I've been swimming among the stories in your unconscious depths, but we have to start working to get 'em all out onto the page. Above all, please just write me. November is a grand celebration of everyone's amazing creative powers, so let's plunge into NaNo's rollicking mayhem and give light to a riveting story. As you can already guess, I'm in. What I'm wondering is who's willing to join me? Anyone up for a month-long bout of noveling insanity? While I can't say that I've ever managed to write a gobsmacking, mind-bending (at least in the positive sense) story, I can say from experience that it's a wild ride.